Labor Day today and what a best way to start your day by heading to your nearest The Coffee Bean & Tea Leaf shop for their #MondaysMadeBetter offer. Today's Php100 Ice Blended drink are Pure Double Chocolate Ice Blended and Double Chocolate Ice Blended. Double chocolaty treat for you and your partner in crime. Get the chance to win Php 1,000 worth of gift certificates weekly. by sharing a creative photo on Instaram or Facebook. 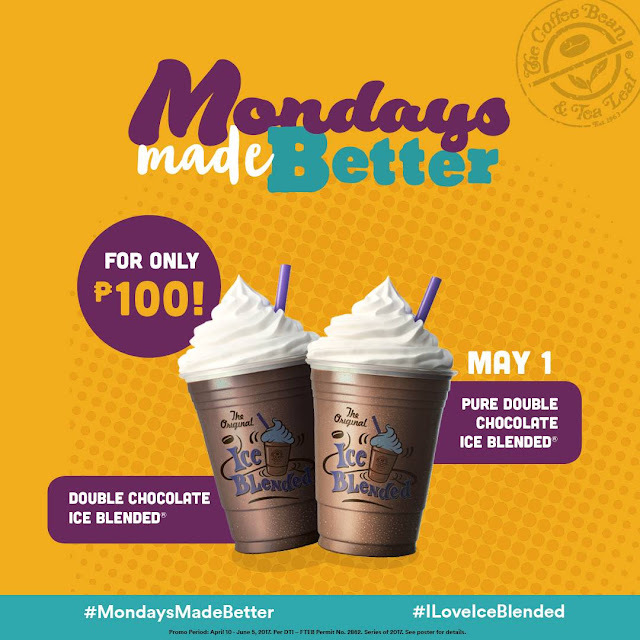 Use the hashtags: #MondaysMadeBetter and #ILoveIceBlended for the chance to win. How about a year worth supply of Ice Blended? Just join at least four (4) Mondays. Be creative, be different. Don't forget to use the hashtags! Double your Swirl Rewards card points when you buy the featured Ice Blended® of the week!